Generally speaking, the law in Canada is that employers can let an employee go at any time, for any reason, or no reason at all, as long as they provide the appropriate amount of notice or severance. There are some exceptions: you cannot dismiss someone based upon a ground protected by Human Rights legislation, and unionized workers have greater protection. However, the recent Supreme Court of Canada decision in Wilson v. Atomic Energy has confirmed another significant exception: non-unionized, federally regulated employees cannot be dismissed without “cause” (not to be confused with just cause). This rule, based on the Canada Labour Code, gives that relatively small group far more substantial job security than the vast majority of workers in Canada. For federally regulated employers, such as banks, it means that their right to dismiss workers is severely restricted, even if they offer a generous severance package. As regular readers would be aware, in Canada there are two forms of dismissals: termination without cause, and termination for just cause. Generally speaking, employers have the right to terminate an employee’s employment at any time without cause, as long as they provide the employee with reasonable notice of the termination, or reasonable pay in lieu thereof. Often the biggest legal issue surrounding these dismissals is the adequacy of the notice offered to an employee. Employment standards legislation sets out the absolute minimum that can be provided. If the contract of employment contains a properly drafted termination clause, then that will establish the employer’s obligation, which can be as little as the legislated minimums. In most cases, there is no such contractual provision, and the employee will be entitled to “reasonable notice”. Contrary to popular opinion, this is not necessarily one month per year of service. Our courts have been clear in stating that there are no convenient formulae or calculations, and that every case is to be assessed on its own particular circumstances. The most common factors are often known as the “Bardal Factors, after the Bardal v. Globe & Mail, decision, which are age, length of service, nature of the dismissed employee’s position, and availability of similar employment. Of course, this list is not exhaustive, and many other factors (such as inducement), can be considered. Termination for just cause, on the other hand, means that an employee is not entitled to any notice or compensation for dismissal whatsoever. Given the harshness of such a result, courts often describe summary dismissal as the “capital punishment of employment law”, and are cautious in upholding such terminations– not to say that is impossible. The courts have adopted a “contextual approach”, looking at all factors surrounding the dismissal, in making their rulings. However, the general theory is that employees can be dismissed any time on a without cause basis, so long as the package is sufficient. The decision in Wilson confirms that this is not the case for a small but significant group of workers in Canada. 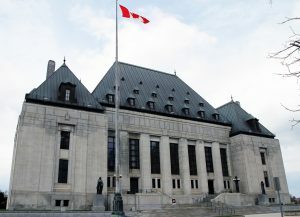 Reversing an earlier Federal Court of Appeal ruling from February 2015, the Supreme Court has ruled that non-unionized employees in the Federal Sector cannot be dismissed without “cause” pursuant to the Canada Labour Code. Division XIV of the Code governs dismissal of federal non-unionized employees. It also provides employees in this sector the right to bring forward a written complaint against any dismissal that it considered to be “unjust”, provided that they had worked for a consecutive 12 months with that employer. The government’s stated purpose behind these enactments in the 1970s was to afford non-unionized employees the right to challenge arbitrary dismissal in a manner substantially similar to unionized employees who, in most collective agreements, cannot be dismissed without good reason or “cause”. Federal case law subsequently took the position that this section displaced the common law right of employers to dismiss an employee without cause by simply providing a severance package or reasonable notice of termination. Traditionally, therefore, the understanding was that an individual employee working for a non-unionized federal workplace could not be dismissed without “cause”. In that context, “cause” could be just cause, or a documented lack of work. However, there would have to be a good reason. If a dismissal was found to be unjust, an employer would then be open to orders for remedies ranging from payment of lost wages to reinstatement of the employee – a remedy rarely awarded in provincial civil, non-unionized cases. This decision creates a significant disparity between provincially-regulated employment, where without cause dismissals are far more common place than cause dismissals, and those governed by the federal Canada Labour Code. This decision will have dramatic consequences for federal employers, who do not have the same flexibility as their provincial counterparts. It also provides significant job security to federal employees, even outside of a union. Given the significant implications of this decision, federal employers are encouraged to contact an Employment Lawyer before proceeding with any dismissal. We can advise them, and also help any federal sector employees who have been “packaged out” and may not realize that no matter how good the package, their employer may not have the right to do so.